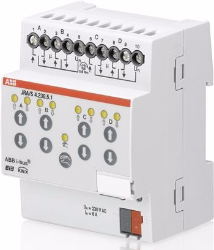 The 2-fold, 4-fold and 8-fold Blind/ Roller Shutter Actuators are used to automatically control independent 230 V AC drives, for positioning blinds, roller shutters, awnings and other shading products via ABB i-bus® KNX. The devices are also used, for example, to control doors, windows and ventilation flaps. The travel times of the drives are automatically determined via end position detection and stored. The outputs can be directly controlled on the device using the manual push buttons. The LEDs on the front of the device signal the status of the outputs. The devices do not require an auxiliary voltage. The Blind/Roller Shutter Actuator is a modular installation device for installation in the distribution board on 35 mm mounting rails. 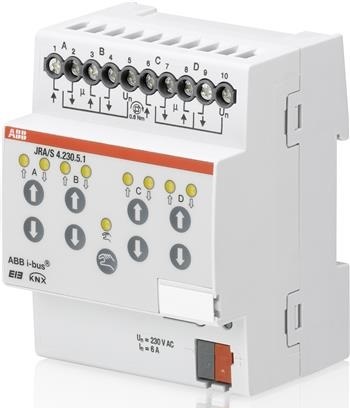 The connection to the ABB i-bus® is implemented via bus connection terminals.